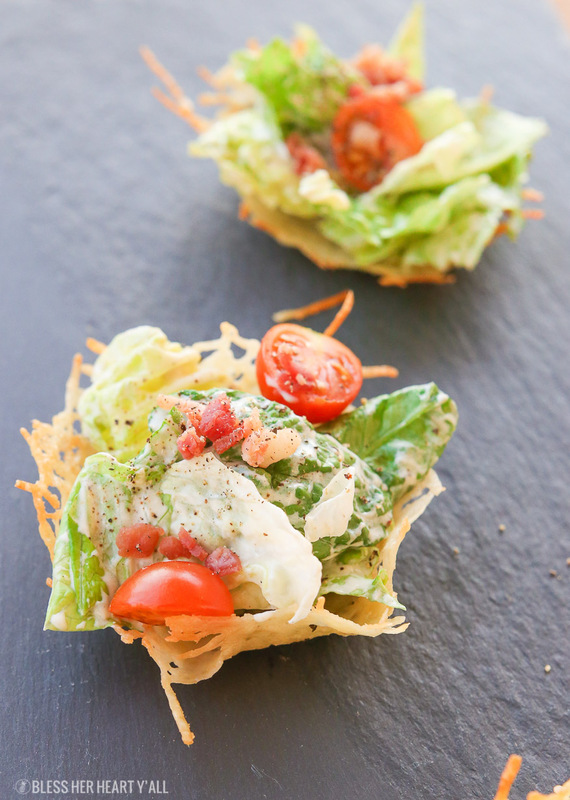 Popular healthy caesar salad parmesan cups are both gluten free and low carb. They are the perfect fancy appetizer for any dinner party, barbecue, or tailgating party and couldn’t be any easier to make! Here in Atlanta we are soooooo excited about the Super Bowl this year! It’s hard to believe that our home team is actually playing in the big game. So tomorrow is a big day for Atlanta and the Dirty Birds. I’ve already planned out what I will be making for the big day and planned so far ahead that I even made a Facebook Live video on BHHY’s most popular recipe that would be perfect for a Super Bowl party. 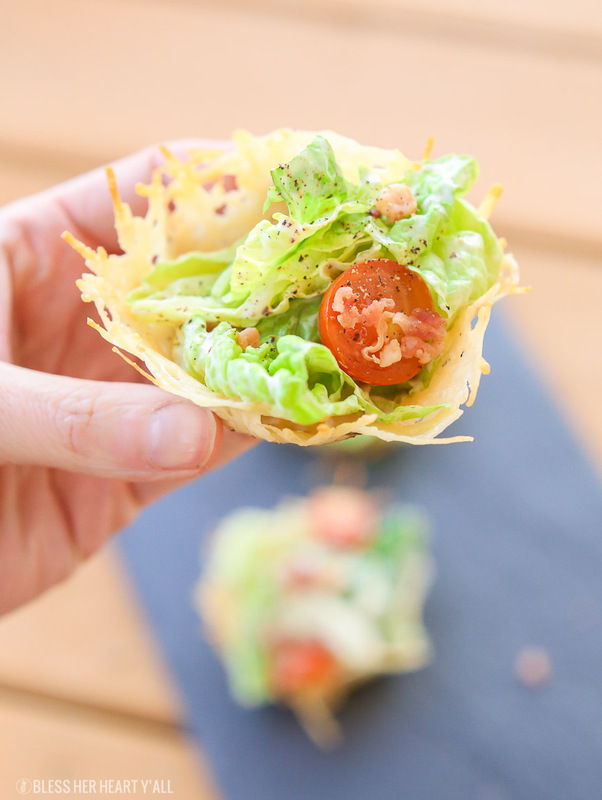 3 ingredients and 5 minutes is all that stands between you and Garlic Basil Parmesan Crisps. 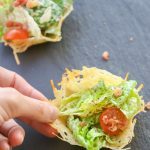 At the last minute I decided to show how I make these healthy caesar salad parmesan cups from the parmesan crisps on the Facebook Live video too. I wrapped up the video and hit “publish”. Then I realized that I had posted the entire video on my personal Facebook page and not the blog’s page. No wonder I wasn’t getting the feedback that I thought I would! Bahaha! So I tried to scoot around the blonde moment and share it to the Bless Her Heart Y’all’s Facebook page but somehow I completely deleted it but was able to save it to my phone. I don’t do technology well y’all! So I do have a video to help show you how I get these cups all thrown together. I’m also putting my Facebook Live skills on hold for a while while I party it up this weekend. 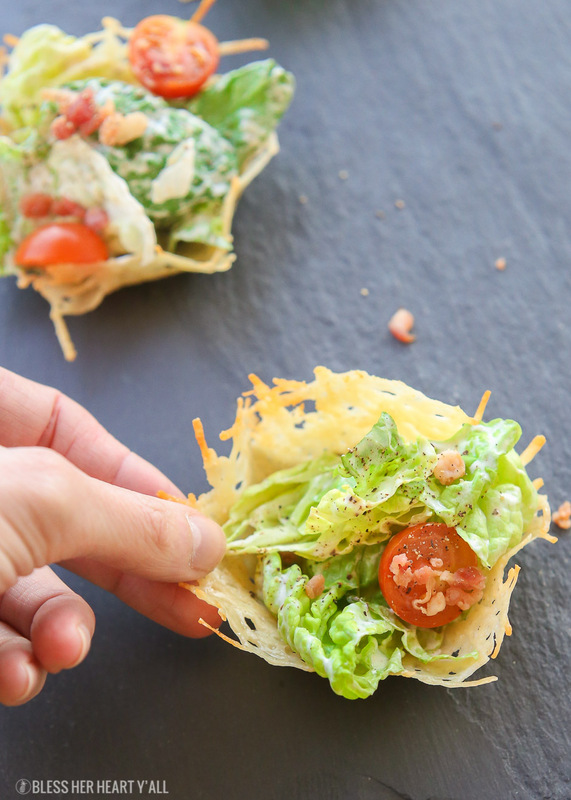 These healthy caesar salad parmesan cups come together really quickly. After pulling the garlic basil parmesan crisps out of the oven, you’ll place the slightly cooled crisps onto the back of a muffin tin and form them into the shape of cups. The healthy homemade caesar salad dressing is made with plain nonfat greek yogurt, lemon juice, garlic, olive oil, and pepper. No creams and no extra cheese necessary. 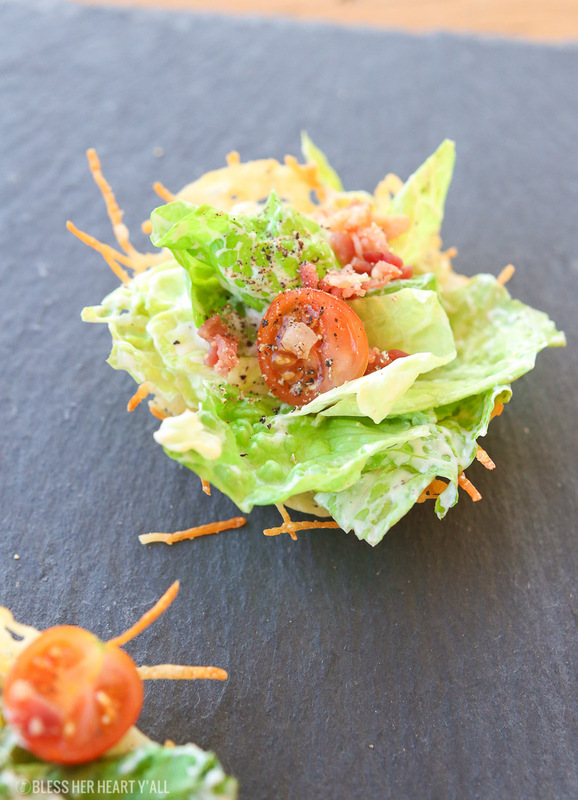 The cups are topped with bacon crumbles and tomato pieces to make you look like the fanciest person at the party. 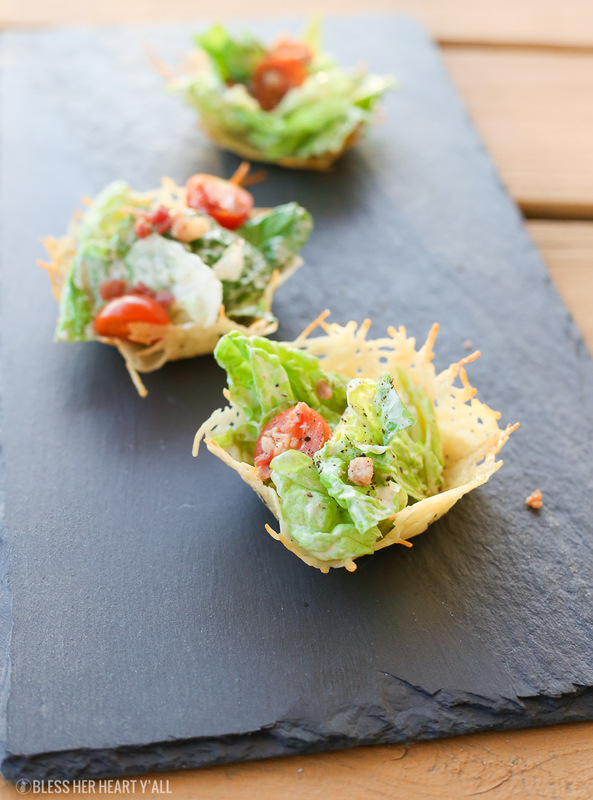 Popular healthy caesar salad parmesan cups are both gluten free and low carb. They are the perfect fancy appetizer for any dinner party, barbecue, or tailgating party and couldn't be any easier to make! Make the cheese crisps according to the garlic basil parmesan crisps recipe. When the cheese crisps are taken out of the oven, allow to cool until warm and pliable to the touch. Move the cheese crisps onto the back of a muffin tin and form into cups. Allow to cool fully. To make the caesar dressing, mix all of the ingredients together in a small mixing bowl and drizzle over a bowl of chopped romaine lettuce. 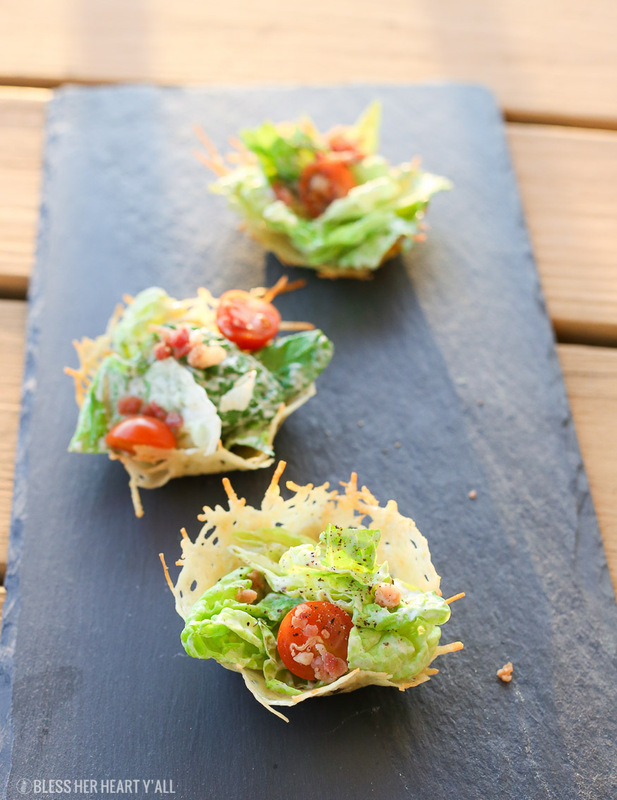 Fill each cooled cheese cup with caesar salad and top with a pinch of bacon crumbles or tomato slices. I hope everyone has a happy and safe Super Bowl Sunday!